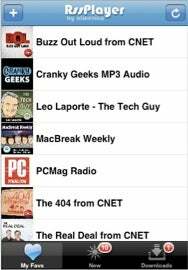 Apple has now allowed the infamous Podcaster iPhone app to surface in the App Store under a new name: RSS Player. As many of you surely recall, Apple had rejected the little application from being sold in the store, consigning it to what Engadget aptly dubbed "a life of ad hoc installs and jailbreaks." So, why the change of heart, Cupertino? No one's quite sure, although in addition to the name change, the app removed the podcast directory functionality from the latest version. Maybe that was it. Or maybe the name RSS Player fooled the App Store gatekeepers. In any case, RSS Player lets you stream or download new podcasts directly to your iPhone without having to sync up with a computer first (which is also possible via the iPhone's iTunes Store app as of the 2.2 update). In addition, though, it will let you bypass Apple's arbitrary cap of 10MB over the cellular data connection. The product will go for $5, but at the moment it's on sale for $2. Our own Chris Breen pronounced the jailbreak version "a very useful application for streaming and downloading podcasts on the go—and one whose capabilities are definitely not found elsewhere on an iPhone or iPod touch." So why are you still here? Go download it already, before 1 Infinite Loop changes its mind.